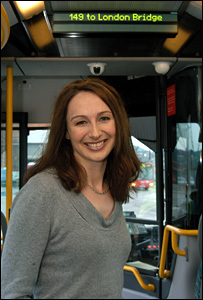 A radio presenter has landed the job to become the voice of London's buses. Emma Hignett will start recording about 30,000 announcements such as "next stop Victoria" for 700 bus routes. Her voice will be accompanied by visual displays. It is part of a scheme to make buses easier to use for those with hearing and vision difficulties, as well as visitors to the city. But Liberal Democrat MP Norman Baker said the scheme was evidence of "incessant verbal garbage" in society. The project will roll out in 2007 as part of the iBus project, which aims to track every bus in London. Ms Hignett's voice was trialled for eight weeks from the beginning of the year on route 149, and 99% of surveyed passengers thought she was right for the job. Her voice will be known to Londoners from her time on Capital Gold and Jazz FM. The 36-year-old currently works for The Local Radio Company as a radio presenter at Darlington's Alpha FM. She said: "I'm thrilled I'm going to be the voice that millions of bus passengers will trust each day to give them information about their journey. "It would be great to think I might soon be as much a part of London as 'mind the gap'." The next step is to put the finishing touches to the signs and announcements, taking on suggestions from people using the trial route. Mr Baker said: "It may be sensible that London buses will now start announcing the stops and making life easier for visitors to the capital to use the bus network, but it must be limited to just there. "There is a tendency in society today for incessant verbal garbage to be added to announcements, and ones created where none are needed." The programme to fit out London's 90 bus garages and 8,000 buses ready for iBus will begin in January, and passengers will start to see and hear the changes from early summer 2007.